Is it just me or does Christmas come around quicker these days? I remember as a kid, Christmas always seemed to be a long way away and the count-down to Santa’s arrival took FOREVER! But these days with growing kids and a business to run, if honestly felt like we had only just taken the Christmas tree down a month or so ago and the kids were asking to put it up again! I’d swear someone is stealing time. But anyway, here I am again writing my Christmas blog and reflecting on the year just gone. We had some really exciting things happen at Rosie’s Doll Clothes Patterns this year. The first was the relaunch of my website with a great new look and easier navigation. I have had some wonderful feedback and will continue to tinker with things in a quest to make my website even better. I also introduced the Free Beanie pattern so you could see just how detailed and helpful my video tutorials really are. This has been super popular with many of you taking advantage of this great offer and becoming part of the Rosie’s Doll Clothes Patterns family. The most exciting thing to happen this year has been the release of my How to Make Doll Clothes course as a DVD set. It has been really well received and the feedback has been awesome. Some of you have purchased it just so you can go back and look at the videos whenever you need to and the reason I loved most was so that ‘when the grandchildren come to stay, they can spend some time sewing doll clothes with mama.’ What wonderful memories that family will have. Next year promises to be another great year with new patterns, new special offers, more great tips and informative blogs. Keep your photos, questions and feedback coming in and I will continue to share them with you all. Thank you so much for being part of the Rosie’s Doll Clothes Patterns family and joining me on this sewing journey. Have a wonderful Christmas with your families and may 2013 bring everything you wish for and more. PS. 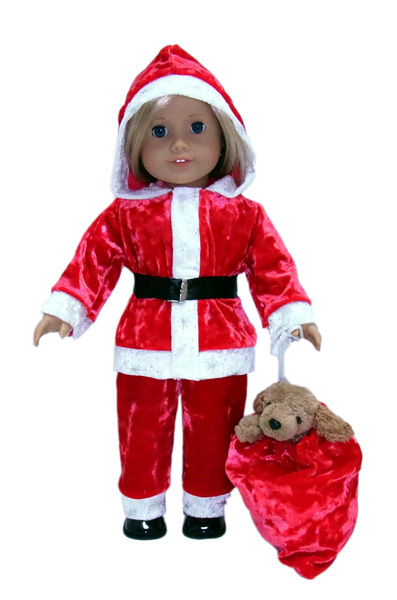 If you want to make a Santa outfit for your doll like the one above, visit my blog from last Christmas where I tell you how I did it….it’s super easy! I have ordered the DVD set but have not got it as yet, I am sure looking forward to starting. It is probably just as well because I would be sewing doll clothes instead of preparing for Christmas. I got the beanie pattern and can’t wait to make it. With your instructions, it does seem easy. Enjoy your holiday and we will be looking forward to having you back in the new year. Thank you for all your hard work on the clothes. Love reading your blog and love other peaoples ideas. Have a very Happy Christmas on the beach and look forward to hearing from you next year, with of course new ideas. Merry Christmas, Rosie, to you and your family. Enjoy the beach. We just left the beach 2 days ago and came north to the snow for Christmas. Personally I prefer the beach. I am looking forward to getting back there in the New year. I have enjoyed my short experience with you and your web site and look forward to more interesting and informative times in the coming year and hopefully beyond. Thank you for your support, encouragement and feedback. Thanks Pat. There is a tights pattern included as part of the bonus Pumpkin costume you received with the course and if you check out my last blog post, you will find instructions on how one of my customers, Peggy, turns a ladies sock into tights. Have a wonderful Christmas Pat and I look forward to hearing from you again in the new year. Thanks for getting me started sewing doll clothes Rosie! I’m looking forward to doing even more in the new year. I hope you have a wonderful Christmas. Merry Christmas Rosie, and a great New year. Thankyou for the news you have sent me over the last year and your blog spot, that I read every time. I look forward to continuing to receive your newsletter. I have saved every one. Thank you all for your lovely Christmas wishes. I look forward to bringing you new patterns and tips in the new year. I asked for Cabbage Patch patterns (so hard to find) and your patterns helped me get pajamas finished in time for Christmas. I consider myself an experienced sew-er but still I found your videos keeping my sewing error-free! My little grandchildren will love receiving their parents’ childhood Cabbage Patch dolls!